Power My Home is a by-product of my enthusiasm. PV solar panels and associated plugins come with so many benefits that its just common sense nowadays. "The fight for civilisation's won; the challenge of keeping it has begun!" At that time, the most popular form of solar technology was solar heating. Today, PV dominates and thus Power My Home. My journey down the solar road was exploratory in the beginning as your doing today. Quenching that thirst for knowledge was my original reason for developing Power My Home. Fifteen years later, thousands of valuable user contributions and nearly four hundred articles to date, the case for PV keeps getting stronger. Within the entire history of the human race, the last two generations have been the first generations without the need to fight for its basic survival. We're currently living through 'the golden age of humanity', and very few people appreciate this. An economy built on cheap oil/energy over the last 150 years is now slowly dying. "A resource to help homeowners drive forward in a world of crazy geopolitics and energy uncertainty." Remember those 'golden age' days of what now seemed reasonable energy bills. Those days are now well and truly behind us. Power My Home is aimed at homeowners who want to save money on energy bills long-term with a solar panel installation and contribute towards humanities bigger picture. The resource has gone from strength to strength with its ability to capture and keep interest in the subject of solar panel technology and has been its unique selling point. I am now happy to work alongside experts who can give homeowners peace of mind. An introduction to the technologies on offer with trusted MCS installers and installation quotes. Created by enthusiasts for your benefit. Why I'm evangelical about PV solar panels? When they train police interceptors advanced driving, one of the first skills they teach you is to see potential danger around you and observe further down the road. This capability should also be used to spot potential problems to our ability to heat and power our homes. 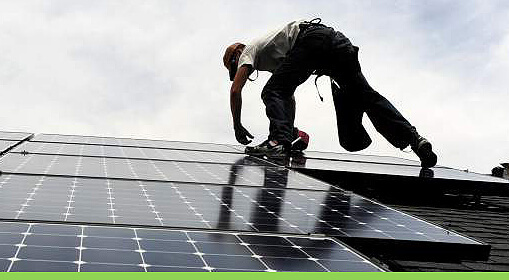 This reason is why the pioneers of solar panel technology choose to install. For more energy independence in a world of global political wrangling and uncertainties around energy security. This technology has a super-long lifespan to help to contribute to that goal individually and nationally as adoption rates increase. With bank rates falling to as little as 3.0% on savings, you will almost certainly get a better return on investment with the feed-in tariff scheme - now available for both electric and heating solar panels. However, be forewarned! The current incentives that give solar technology a significant return on investment at the moment will gradually reduce to newer adopters, as uptake increases. This is a window of opportunity that will not be around for later adopters. Over the last 50 years, solar technology has been refined and tweaked to a point where we can now get outstanding performance, even in the United Kingdom and more generally the northern hemisphere. The old myth that solar technology doesn't work well as a myth back then and even less accurate today. These years of extensive research and development have brought this much-needed technology into our homes and will continue to do so as conventional fuels continue to become more expensive. Back in the 1950s, my grandad was lucky enough to be able to buy a new Volkswagen Beetle. Motorways were still a new phenomenon, so being able to take his family out on day-trips to the seaside when other families again relied on coach trips, must have filled him with much joy and pride. My grandad loved that car so much that it was still in mint condition and much loved even when I grew up in the 1990s. There are not many technologies in life that can last so long and enthuse such pride in a family, but solar panels do just that too. National and international issue's show that solar panels will not be a lifestyle choice, but a necessity to reduce the effects of continued energy price rises. Year-on-year price increases and the need to make proper grown-up decisions about our energy needs have brought the PV and EV markets to the mainstream, and I am particularly pleased that people are beginning to view this technology as seriously way of generating their energy requirements. I'm hoping this website will help you see the world slightly different, more fragile, more vulnerable. After all, to be aware, is allowing people to prepare. I am hoping the Power My Home website can help aid our civilisation's transition away from the 'age of oil' with less of a bump. Otherwise, enjoy it while you can, because the outlook for future generations is bleak. I foresee a father and his son sat around a campfire chatting. The father tells his son that once, in times gone by, there were high iron eagles that left spider webs across the sky. People once walked on the surface of the moon, but they both know that this is only a legend - a myth passed down the generations. Welcome to the solar century. The race to be the first energy independent economy is on. Germany with a similar climate to the UK is winning that accolade, as they produce so much power from wind and solar panels that they export excess power to neighbouring countries for free. This increase in alternative generation also led to a marked decrease in coal-based electricity generation. Just take a moment to digest those facts. This week, more justification of my dogged and somewhat baffling (to some) determination to see the solar technology's rightful place in our progression, has come in thick and fast this week with some of the most influential people in the world. The reality that the world is dealing with the facts of its problems and finally pushing the human race forward, despite the UK dragging its feet like a belligerent toddler with a sugar addiction. You want Coal, they or their families own the mines. You want Oil and Gas; they own the wells. You want Nuclear; they hold the Uranium. You want solar power, unsurprisingly, they say solar isn't feasible because they can't meter the sun. Surprisingly, not everyone in Britain shares this future vision, only because solar-power cannot be controlled or metered for profit. Unfortunately, we in the UK live in a media-controlled land, led by politicians and media barons with allegiances to keeping the fossil burning. So the next time you hear someone say "Solar panels don't work well in the UK", you can almost guarantee that they get their thoughts, tastes and attitudes from newspaper barons who have personal financial interests in continuing the status quo. And that's how you ended up with frackers on your doorstep. In fact, in this crazy economic model, they have intertwined the baby boomers pension funds with the continued burning of dead dinosaurs. That's the real reason newspaper owners spread misinformation about this alternative technology. Through no fault of their own, pensioners are now in a situation, where they are reliant on a system that holds back human progress and destroys the future of their predecessors. However, the tide is now turning, and countries and manufacturers are investing in green-technologies to kick-start the 21st-century finally. I would love to think that Hillary Clinton, Donald Trump and Angela Merkel and many other of the world's most visionary world leaders are following my romantic lead, but I suspect the truth is down to a fact of inevitability. Despite this, that wasn't obvious even twelve years ago when I first began putting Power My Home together in my spare time, and I continue this vital work to this day. My own stubborn and dogged determination to prove naysayers wrong, including the last government who did everything in their power to destroy a fledgeling solar industry - drives me today. And that brings me to EV technology. As the UK is still coming to terms with the fact that solar panels; do work, German manufacturers and others worldwide have already been steaming ahead with research and development to tap the potential that solar panels can offer. Only five years ago, when your photovoltaic system produced surplus energy, the only choice you had was to export that power to the National Grid. Today, new developments in solar technologies mean your photovoltaics can heat your hot water tank, charge your new EV car and even store power with new solar battery storage capabilities for night time usage. The traditional 'centralised' energy model that our media barons have been so determined to hang onto is being eroded away, despite their political meddling and misinformation. But, the real solar salesmen will be your high energy bills as the promises made by fracking fail to materialise and the mega higher cost of nuclear-based electricity that our esteemed leaders have recently signed us up for - begin to bite. However, the real benefits of solar panels and new associated technology's will come apparent as the current glut on the world's oil market begins to subside. Suddenly, the super smooth, super fast acceleration that comes with a new electric vehicle will get your juices flowing. Charge your new EV with photovoltaics, and the free mileage will just seem super-sensible. Despite the bungling of our recent government's 'green energy' policies, a brighter and solar-powered future is now unfolding before our very eyes. I'm proud that I supported this game-changing technology, even in the darkest of its days. I hope you can now see the benefits of these new and exciting technologies and adopt them into your life too.